Collaboration, interdisciplinarity, and transdisciplinarity are widely invoked in the rhetoric of academic institutions today. This panel will question the assumption that we are currently in the midst of a "golden age" for new forms of research. The panel will first frame the question historically by examining the origins and course of "interdisciplinary" initiatives that began in the United States in the 1920s, primarily through the Social Science Research Council with support from the Rockefeller Foundation and Carnegie Corporation of New York. This examination will consider both the fate of such initiatives and implications of historical scholarship and analysis for current and future efforts—in the United States and elsewhere—to sustain creative multi, inter-, and transdisciplinary team science. Next, the presenters will situate the question in the career reward system, where individuals too often find their collaborative work impeded, discounted, or marginalized. An overview of barriers to tenure and promotion in institutional structures and policies will be followed by current models, strategies, and guidelines for professional development throughout the career life cycle. Finally, the panel will address how researchers engaged in collaborative team science define transdisciplinary research and their perspectives on transdisciplinary processes and outcomes, as well as how cross-disciplinary research orientation relates to researchers’ collaboration networks. The panel will conclude by suggesting core principles and implications for studying transdisciplinary research. Kara L. Hall, Ph.D. is a health scientist in the Office of the Associate Director of the Behavioral Research Program in the Division of Cancer Control and Population Sciences (DCCPS) at the National Cancer Institute (NCI) working in the areas of behavioral science, dissemination and implementation science and the science of team science. During her career, Dr. Hall has participated in a variety of interdisciplinary clinical and research endeavors. Her research has focused on the development of behavioral science methodologies such as the design of survey protocols, meta-analytic techniques for health behavior theory testing, as well as on applications of health behavior theory to multiple content areas and the development of computerized tailored interventions to foster health promotion and disease prevention behaviors. 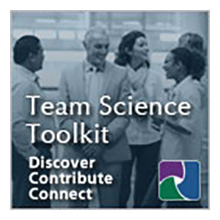 Additionally, Dr. Hall leads the DCCPS science of team science team, focused on advancing the field by developing new metrics, measures and models for understanding and evaluating transdisciplinary research, collaboration and training - specifically in the context of large research initiatives. Dr. Hall served as a co-chair for the 2006 conference “The Science of Team Science: Assessing the Value of Transdisciplinary Research” and co-editor for the recent American Journal of Preventive Medicine Special Supplement on the Science of Team Science. Dr. Hall earned her Masters and Ph.D. in Psychology at the University of Rhode Island. Frank Kessel, Ph.D. is a health scientist in the Office of the Associate Director of the Behavioral Research Program in the Division of Cancer Control and Population Sciences (DCCPS) at the National Cancer Institute (NCI) working in the areas of behavioral science, dissemination and implementation science and the science of team science. During her career, Dr. Hall has participated in a variety of interdisciplinary clinical and research endeavors. Her research has focused on the development of behavioral science methodologies such as the design of survey protocols, meta-analytic techniques for health behavior theory testing, as well as on applications of health behavior theory to multiple content areas and the development of computerized tailored interventions to foster health promotion and disease prevention behaviors. Additionally, Dr. Hall leads the DCCPS science of team science team, focused on advancing the field by developing new metrics, measures and models for understanding and evaluating transdisciplinary research, collaboration and training - specifically in the context of large research initiatives. Dr. Hall served as a co-chair for the 2006 conference “The Science of Team Science: Assessing the Value of Transdisciplinary Research” and co-editor for the recent American Journal of Preventive Medicine Special Supplement on the Science of Team Science. Dr. Hall earned her Masters and Ph.D. in Psychology at the University of Rhode Island.